As I mentioned last week, things on the Literary Sofa are currently all over the place with lots of guest posts in the pipeline and as it turns out this week, the occasional gap. 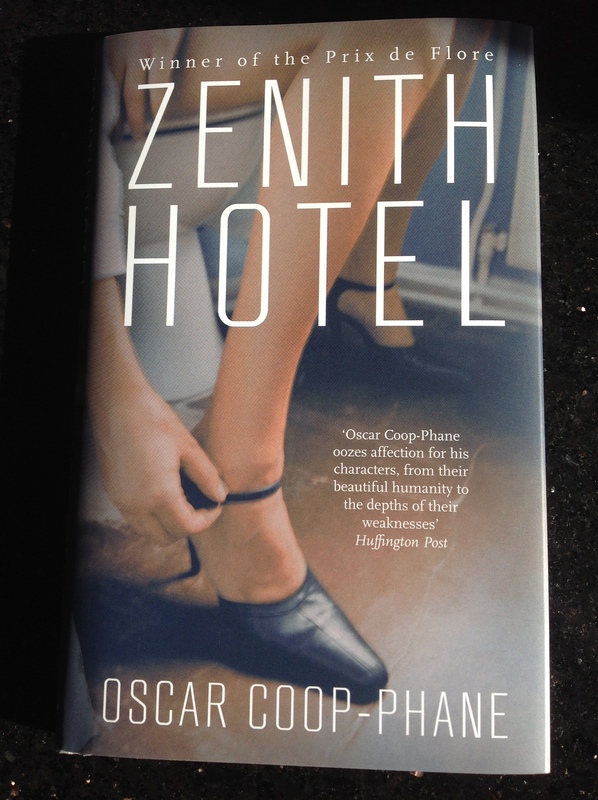 It seems like the perfect opportunity to review a very short book which made a disproportionately big impression on me, Zenith Hotel by Oscar Coop-Phane. His dazzling arrival on the French literary scene aged just 24 earned him the prestigious Prix de Flore in 2012. He is being published in the UK by the small independent Arcadia Books who have also bought his second title Tomorrow, Berlin scheduled for release in 2015. Zenith Hotel first crossed my radar when I asked for recommendations set in present day Paris on Twitter (I was amazed at how many replies I received). I read it in the original French but can also vouch for Ros Schwartz’s excellent translation because I went back and forth between the two versions looking at how she did it (believe it or not that’s my idea of fun). At 99 pages – in a beautiful tiny hardback edition – it is difficult to define Zenith Hotel, but therein lies much of its appeal. I wouldn’t call it a novel or a novella, not just on account of its brevity but because it doesn’t so much tell a story as paint pictures – there’s no plot. It’s a day in the life of Nanou, a street prostitute, spliced with the lives of her clients, their actual encounters no more than hinted at, but with the kind of finishing strokes which make a real difference to the whole. I’ve often said how much I admire authors who can write beautifully about the dark and ugly. It’s very difficult, but Oscar Coop-Phane does it exceptionally well. His writing is astonishingly powerful and direct and suggests a lot more life experience than one would expect from such a young writer. Everything here is the flipside of the Paris love and romance cliché: it’s tawdry, seedy and shocking but for all that, these intensely moving portraits of disconnection and loneliness are realised with an exquisite blend of compassion and brutality. In Paris, at least, you can count on anonymity. Being lost in the crowd without anyone bothering. There are swarms of people all around your body, but no one notices you. Since reading Zenith Hotel a few weeks ago I’ve thought about it often, especially when I was in Paris, and I’ve realised just how brave and clever the author is being, to risk leaving the reader unsatisfied. And if he chooses not to tell you too much, I won’t either.